Andy Carter took 17 wickets in division one of the championship cricket last year before a back injury ended his season. 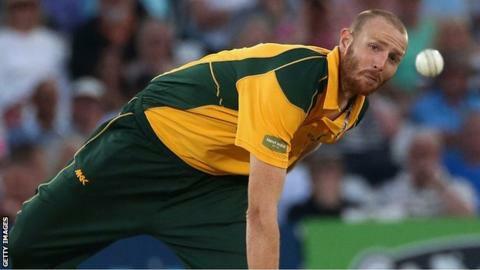 Nottinghamshire fast bowler Andy Carter will join Glamorgan on a month's loan to cover for Australian Michael Hogan. Carter, 26, will be available for Championship matches against Leicestershire, Surrey and Derbyshire. Hogan hurt a hamstring playing for Western Australia and hopes to return against Derbyshire on 2 May, but is still awaiting further medical opinion. "I've done a few running sessions, it feels positive but we'll wait and see how the scan comes back," Hogan said. "I can do 85 to 90% of the things I'm required to do but we're not sure if I can bowl or not. We're quite tentative as to getting back into bowling because that's what happened last time I went back maybe a week too soon. "It felt really good before and it happened [the re-occurrence]. "So it's frustrating I'm not able to participate in full training but positive in that it could have been a potential three-month injury and it's not going to end up like that." In the meantime Carter, who has taken 70 wickets at 29.71 in 24 first-class matches since his debut in 2009, is set to make his first Glamorgan appearance at Grace Road on Sunday. "I'm keen to play first-class cricket and Nottinghamshire want me to be involved in competitive matches," Carter told the Glamorgan website. "I've never been one to sit around and my previous loan move to Essex worked out well for me and helped me to break into the Nottinghamshire team."